The new Series 4 represents the biggest update to the Apple Watch since the original. What’s with the S4 SIP? It can take an ECG/EKG? What about other new health features? Will my old bands still work? Are there new watch faces? Are there any changes to the materials or colors? For the first time since its introduction in 2014, the Apple Watch has a new design—and this time it’s a bit more substantial than sticking a red dot on the Digital Crown. For the watch’s fourth generation, Apple has introduced a larger screen and a slightly bigger case, all while retaining the classic styling that made the Apple Watch a worldwide hit. 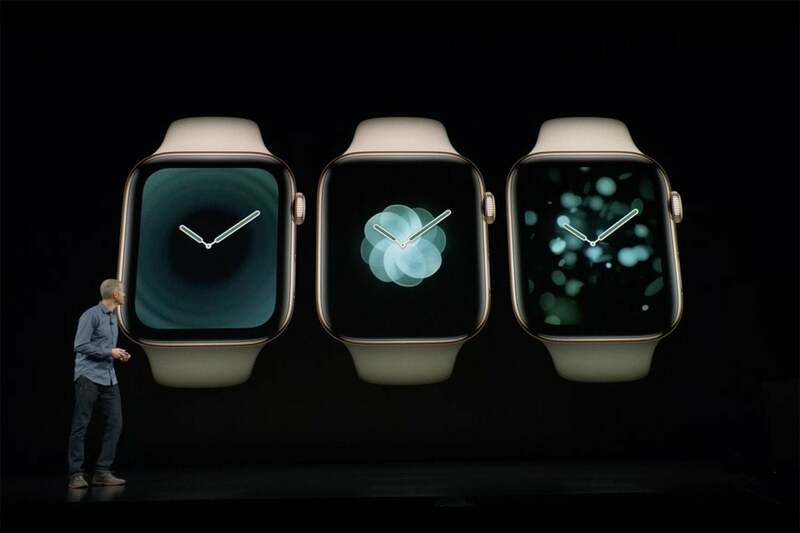 But the beauty of the new Apple Watch’s isn’t merely skin deep. Apple has updated nearly everything about the watch, inside and out. It’s a whole new generation: familiar, yet overhauled. Much as with previous Apple Watch releases, the Series 4 comes in two sizes. But while Series 0-4 measured 38mm for the smaller watch and 42mm for the larger (measured vertically), the new ones are each 2mm larger: 40mm and 44mm. The corners on Series 4’s case are also slightly more rounded, giving the watch a softer appearance. And the display area is much larger, with rounded corners that follow the contour of the case and smaller bezels. The new Series 4 is a touch larger, but with more rounded corners, and the dispaly is a lot larger. At 10.7mm thick, the Series 4 is slightly thinner than the Series 2 and 3 (which measured 11.4mm), but it’s still just a tiny bit ticker than the original Apple Watch (10.5mm). The Series 4 is more expensive than any previous standard-issue Apple Watch. These are the starting prices. Some bands like the Milanese Loop raise the price, as do special editions like the Hermès models. Apple’s new system-in-package (which combines the CPU, GPU, storage, RAM, and almost everything else) is called the S4. It’s a dual-core chip that Apple says is up to twice as fast as the S3 found in the Series 3. It’s also, for the first time, a 64-bit chip. That probably doesn’t make much difference now, but it gives the watch a lot more longevity down the line. We currently don’t know how much RAM is in the Series 4. The Series 0, 1, and 2 Watches had 512MB of RAM, while the Series 3 boosted that to 768MB. It’s a safe bet the Series 4 has at least 768MB, maybe more. The Series 4 watches all have 16GB of storage. With the Series 3, you got 16GB in the LTE version but only 8GB in the Wi-Fi version. 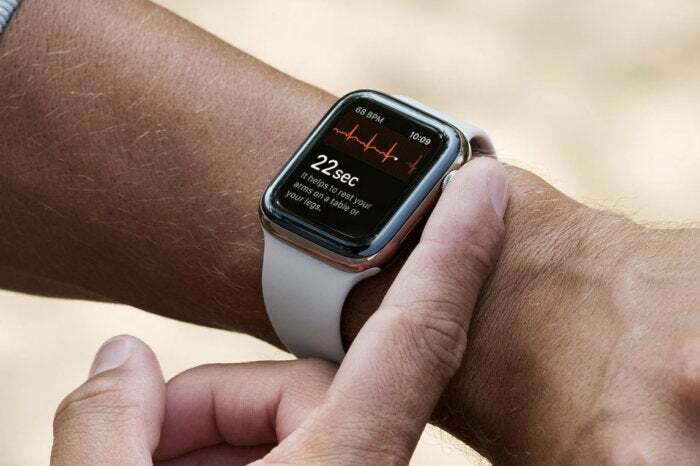 The Apple Watch Series 4 lets you take your own single-lead electrocardiogram by holding your finger on the Digital Crown for 30 seconds. The watch stores the resulting EKG measurement in the Health app, where you can make a PDF of the report to share with your doctor. You can take an EKG with the Series 4. At least, you will be able to in the U.S., after a software update. This feature has FDA clearance, but that does not mean it has FDA approval. Basically, the FDA says it can be sold and used for the advertised purpose (by anyone older than 22), but it is not a medical-grade device that has undergone the FDA’s rigorous testing requirements. In short, it’s useful and real, but it’s not a substitute for an EKG that your doctor would give you. EKG support is initially limited to the United States, and it will not be available right when the Series 4 launches on September 21. It will be added in a software update to watchOS 5 later in 2018. Accidental Fall detection: The new accelerometer is more sensitive than before, as it supports a more dynamic range and reports data much faster. All of this means that Apple can now use it to detect accidental falls. If you take a tumble, the Apple Watch Series 4 displays a message that makes it easy to call emergency services. If you’re unresponsive for 60 seconds, it places the call automatically and also sends a message to your designated emergency contact. This feature is only enabled by default for users over the age of 65, but younger users can enable it if they wish. Irregular Heart Rhythm warnings: The new optical heart rate sensor is more battery-efficient, so your battery won’t drain quite so quickly when you’re tracking workouts. In addition, it can better detect irregular heart rhythms (like atrial fibrillation and an unusually low heart rate) and warn you about them. Like EKG support, irregular heart rhythm warnings are coming in a software update later this year. If you have Apple Watch bands for the earlier 38mm models, they will fit the new 40mm Apple Watch Series 4. The watch bands for the 42mm models fit the new 44mm Series 4. Apple says overall battery life is similar to that of the Series 3, which means you can expect around 18 hours. However, it should last about an hour longer when tracking outdoor activities with GPS, LTE, or music streaming. No matter which Apple Watch you have, you get four new Apple Watch faces in the watchOS 5 update: Breathe, Fire & Water, Vapor, and Liquid Metal. On Series 1-3 Apple Watches, these faces are circular with room for complications in the upper corners. On the Series 4, they fill the entire display. 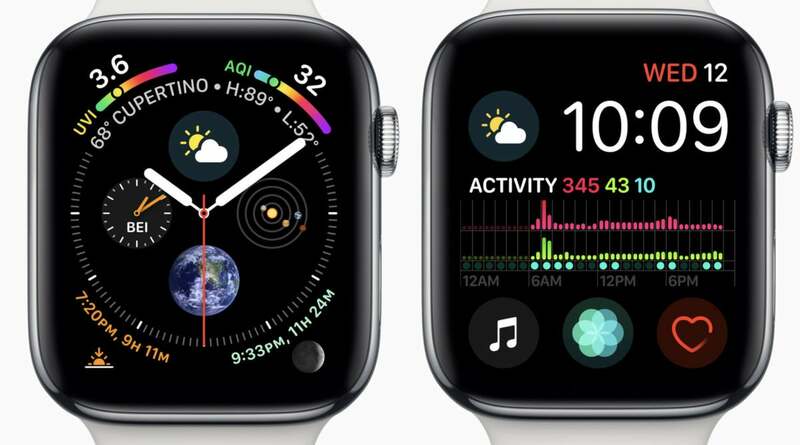 Because the Series 4 has larger displays, there’s room for more information, and Apple has added a couple of exclusive new watch faces that are especially information-dense. There’s the Infograph, which combines an analog watch face with room for eight complications, and Infograph Modular, an upgrade for the current Modular face that allows the large center complication to show much more info. Apple has a pair of new Series 4-exclusive watch faces that are dense with information. The Series 4 also supports a new kind of complication that’s designed to go in the corner of round watch faces, which includes a curved line to represent data (like high and low daily temperatures or time remaining on a timer). Like the new iPhone Xs, the Series 4 is now available in a gold color in addition to silver and space gray. Note that this isn’t the actual gold material that made some of the original Apple Watches sell for $17,000; it’s just a gold color for the stainless steel or aluminum bodies. The gold stainless steel color looks really sharp. The Series 3 is still available, but the gold aluminum model is gone—now you can only get it only in silver or space gray in either steel or aluminum. The full ceramic “Edition” models have been discontinued across the board. The Series 3 and 4 are both still available in Nike+ models, and the Series 4 is available in a Hermès edition (stainless steel only). 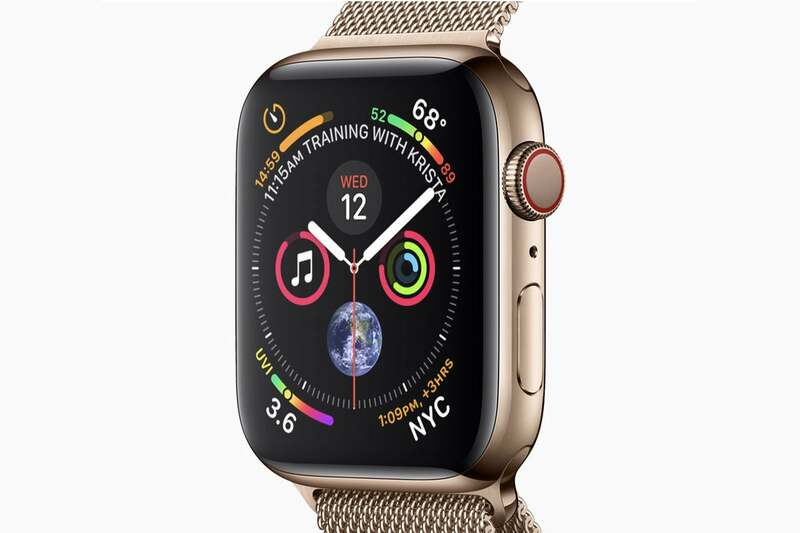 This story, "Apple Watch Series 4 FAQ: All your questions about the new Apple Watch, answered" was originally published by Macworld.